This permission has administrative powers over the whole account and should be considered for ‘backup’ strategies. Allows to access funds and some account settings, but cannot change the owner permission and is thus considered the “online” permissions. Both can be defined in the Permissions tab of your account using so called authorities together with a so called threshold that has to be exceeded in order for a transaction to be valid. Authorities :In BitShares an authority consists of one or many entities that authorize an action, such as transfers or trades. The Permission page locates in a side menu. Active permissions define the accounts that have permission to spend funds for this account. Owner permissions define who has control over the account. Owners may overwrite all keys and change any account settings. The memo key is where you receive memos, in order to decode the memos you need to control the private key for the public key. By using a public/private key pair without spending authority, you may give read-only access to your memos to third parties. 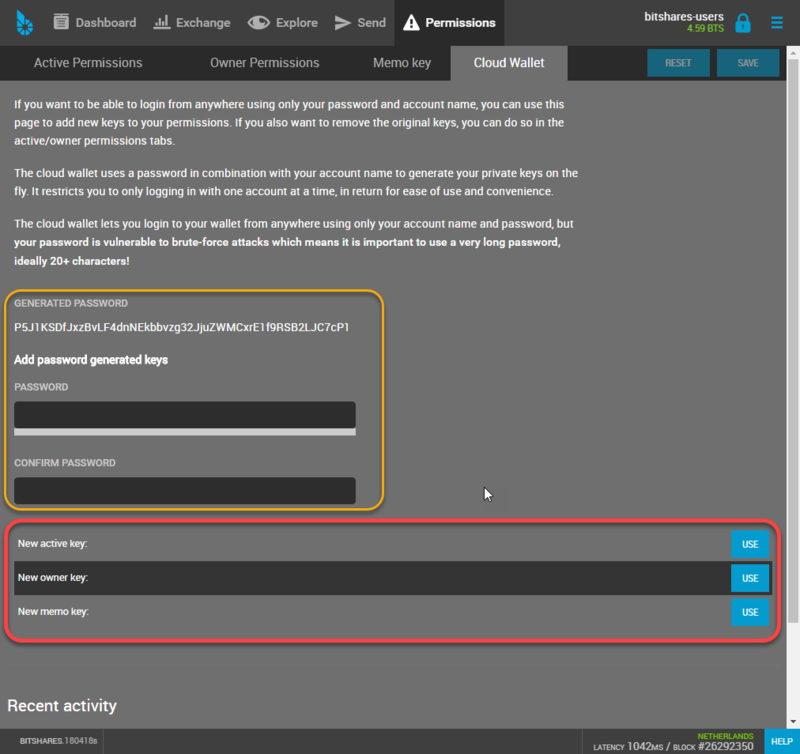 You can use this feature, if you want to change your Cloud wallet password. In this section, we will show you how to find your private key. 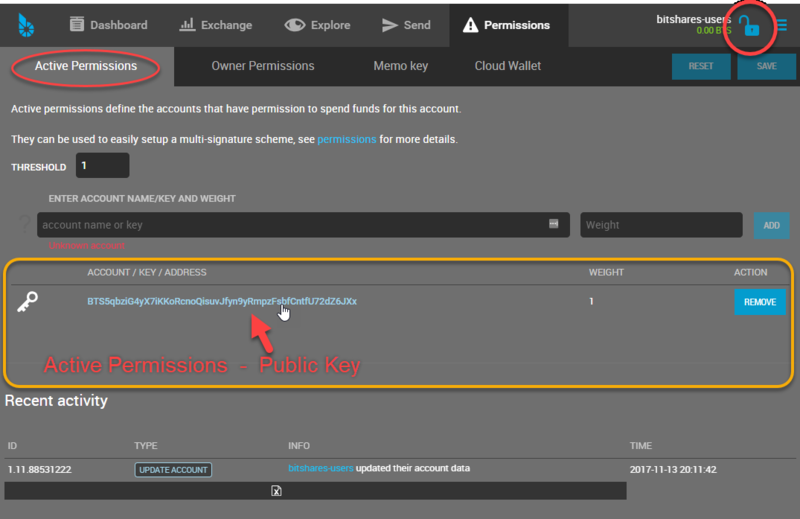 You can find each Public key and Private key on the Permissions page. If you cannot click nor find a link, login to your wallet. Click a private key number or a key image. 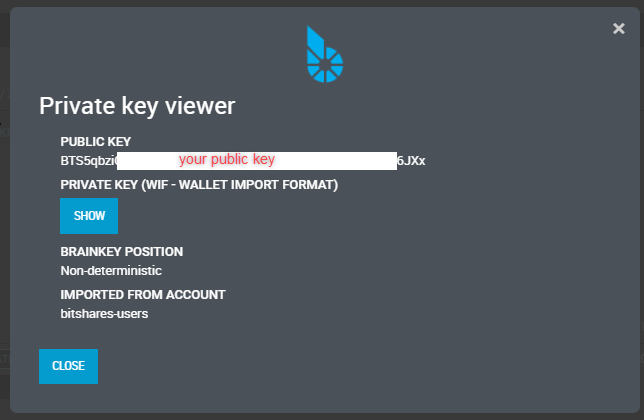 A Private key viewer form opens. You will find a Public Key and a [SHOW] button like below. Click the [SHOW] button. You will find your Private key under the Public key. 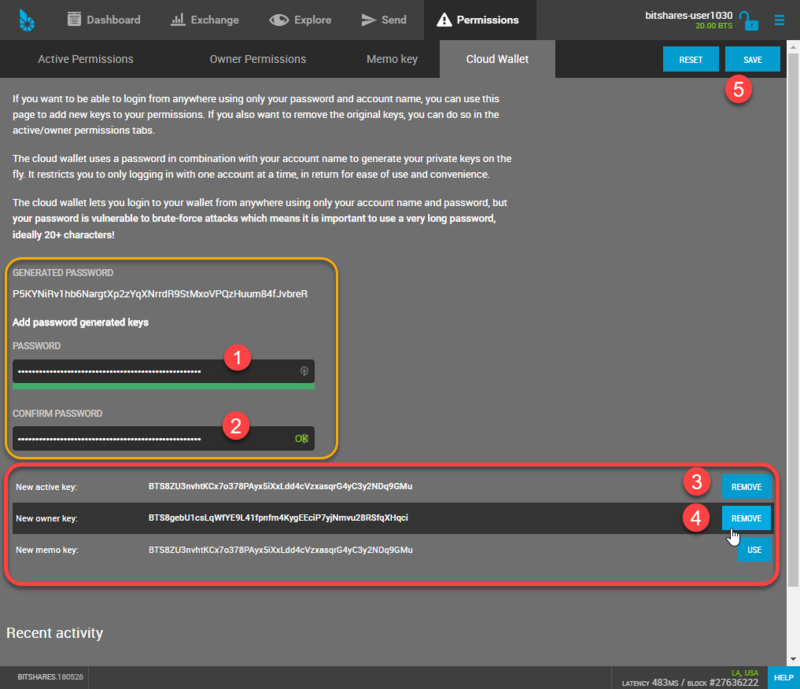 In this section, we will show you how to change your Cloud Wallet password. 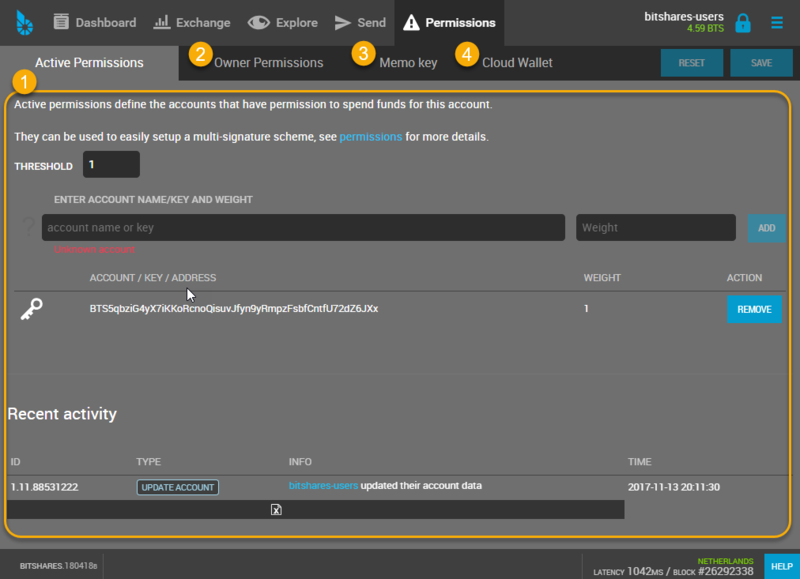 If you want to change your Cloud Wallet password, use this page. You will change your password and your keys during this process. When you replace the memo key you will not be able to see old memos, so if you have a lot of those we recommend saving the old memo private key. Click the [SHOW] button. Log in to your wallet if necessary. You will find your Private key under the Public key. Write down and save the Private key. You can use your desired new password or use the auto-GENERATED PASSWORD. In this example, we decided to keep old Memo keys. In order to remove access using your old password, you need to remove the keys corresponding to the old password. Log out, and log back in with your new password. You will see the two public keys. The light blue colored key is your new public key that is belongs to your new password. You want to keep only this key! (#6)Click [REMOVE] next to the plain colored key. In this case, remove “P5J3maQ7kCDxaUfbBCRKwTwWnPwCp6h5sZU6va7C9sYW6”. Now go to the Owner tab and do the same for the old owner key. (#7)Click [SAVE] – Do not forget to save!